I'm fascinated by opal and its mythical reputation, so much so that my main character in my forthcoming novel, The Last Romanov, possesses an opal eye. My interest in this gemstone started long before I began my research for my book. Perhaps my attraction was due to the fact that opal, like a lover, thrives when in close proximity to the warmth and scent of its wearer. You have to love a precious stone that is perceived as sensitive and emotional, a gemstone with the power to unearth and reflect its owner's feelings -- a jack-of-all-trades, a guiding beacon in this increasingly tortuous path of our lives. In ancient times, for example, Arabs believed that opals were magical stones that rained from the skies. Zeus was so pleased to defeat the Titans, his tears of joy turned into opals when they fell at his feet. Throughout the Middle Ages, opal was called "ophthalmios" or the "eye stone," because it was considered beneficial to the eyes. Europeans thought it would make the wearer invisible if wrapped in a fresh bay leaf. And in the Orient opal was cherished as "the stone of hope." Every culture had and continues to have its own beliefs about opal and its healing properties, whether it brings good or bad luck, and whether it represents the evil eye or magical elements of fire. "Fire color" is a term used to convey the array of flashing colors in the heart of the fire opal -- among the most precious of opals -- a striking optical phenomenon that reveals the entire spectrum of color, creating the illusion of fire. No other precious stone seems to be so intimately connected to images of fire. This is exemplified in the numerous names given to the captivating fire patterns in opal -- pinfire, flashfire, broad flashfire, and rolling flashfire to name a few. 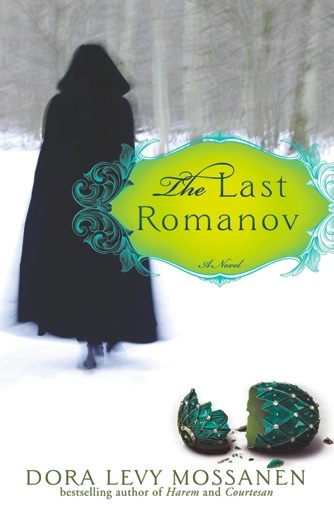 Slowly, quietly, even sneakily, the element of fire began to emerge in my historical novel, The Last Romanov. "Sneakily" because it was not until I had finished the second and perhaps third draft of the novel that I realized how central all types of fires had become to the story. Did I mention my fascination with fire? No! That's for another time. "Amalia, a middle aged Mexican-American woman, walked along lower Sunset Boulevard when she saw a bridal shop. She paused, walked on, and paused again. That was it; a casual moment that then became central to the whole novel, Amalia having signaled to me its then-unknown importance." Having taken this lesson to heart, I paid attention to the emergence of the many fires in my story -- the small bonfires Little Servant ignites around the Entertainment Palace to keep himself warm, the flames in the fireplaces in the Romanov palaces that rather than warm Darya, my protagonist, make her shiver. And the "Big Fire," the mother of all fires, which seems to possess a will of its own and goes awry when the Bolshevik Commandant Vasiliev attempts to burn Rasputin's corpse. Not wanting to rob you of the pleasure of surprise, I'll stop here, certain that those of you, who will read The Last Romanov in April, when it comes out, will recognize the importance of fires and its centrality to the story, especially the most significant fire of them all: Athalia's fire.